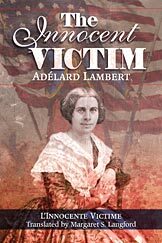 In choosing to translate The Innocent Victim, by the immigrant author Adélard Lambert, Margaret Langford, as both educator and translator, contributes to the preservation of Franco-American history and heritage and promotes the understanding of its cultural significance. Lambert's entertaining and informative novel, The Innocent Victim, is enhanced by the insight and background information Langford provides as she makes this important work available to those interested in Franco-American history and culture. This is the story of The Innocent Victim--a metaphor of lives changed forever: border crossings that are part of the inner and outer landscapes--a people leaving their homes and their way of living. A nation on the move for generations to come. Rhea Côté Robbins, Director, The Franco-American Women's Institute of Maine. Author of Wednesday's Child. Margaret Langford has brought out of obscurity that rarest of writings--a Civil War novel written in French! Her annotated translation thus reveals a little-known aspect of the American Civil War: the participation of French Canadians in rather large numbers who fought valiantly for the Union. Dr. Langford deserves high praise for bringing to light a significant, but largely unknown and under-appreciated component of a crucial event in American history. A fast-paced tale of deceit, determination, lies, love, loss, and murder. The dramatic story of Jean and Marie Legendre enlightens the reader about the experience of 19th century French-Canadian immigrants to New England, the emotional impact of such a migration on individual French-Canadians and their families, and the challenges they faced in a new country. The Innocent Victim combines fiction and history in a delightful story that is both entertaining and educational. Foreword, Preface, Introduction, Chapter Notes, and Bibliography in addition to the translated text. Dr. Margaret S. Langford is a professor of French at Keene State College. Her sabbatical leave projects in 1984 and 1992 focused on oral interviews and research on Franco-Americans. In 1999 her leave was devoted to Un Revenant/One Came Back. Since 1996 she has interwoven research, publications, and presentations first on this work and subsequently on L'Innocente Victime/The Innocent Victim. In 1992 the American Association of Academic Alliances honored her for outstanding contributions to the teaching and promotion of French as a second language. In 1994, the New Hampshire Association for the Teaching of Foreign Languages selected her as teacher of the year. In 1998, she received the New Hampshire Excellence in Education Award. In 2007 she devoted her sabbatical leave to L'Innocente Victime. Margaret Langford is presently incorporator of the Franco-American Centre in Manchester, New Hampshire, a member of the Historical Society of Cheshire County and of the French Institute at Assumption College. Dr. Claire Quintal is professor emerita of French and Francophone Culture and Civilization as well as the founding director emerita of the Institut francais of Assumption College. Founded in 1979, the institute, which has published the proceedings of its colloquia, launched in 1980, is considered to be the foremost research center on Franco-American history and culture. To date, sixteen volumes, edited and/or translated by Claire Quintal, have appeared. She was awarded the Legion of Honor and named an officer of the national Order of Merit by the French government. Québec honored her in 1980, naming her to the Ordre des Francophones d'Amérique. She is a member of the Conseil de la Vie Française en Amérique and chairs the American and Canadian French Cultural Exchange Commission of Massachusetts.